First Line:"Somewhere nearby, Benjy was waiting for me." Review:I absolutely adored Pawn the first book in The Blackcoat Rebellion series but Captive took this series to a whole another level of goodness. 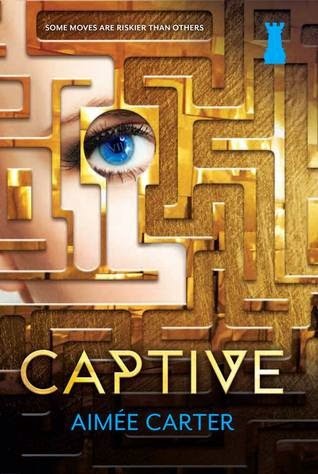 I'm always a little hesitant to pick up the second book since a lot of series suffer from the second book syndrome but not Captive, it was actually better then Pawn. Captive was a lot more darker and a lot more violent. There were so many twists and turns that I didn't know what to expect. Kitty's world has become even more hostile then what it was in Pawn. She ends up in the one place she feared the most Elsewhere and just when she thought all was lost she finds allies in the most unlikely of all places. We meet more new characters and some I really liked but don't think about getting attached to the characters in this book, Carter has no issues killing characters off which of course made it more realistic and that much better. I liked Kitty from the first book already but I found myself having an extra dose of respect for her after reading Captive. Just when I thought she would crumble and be a complete mess she showed strength and determination more then ever ready to do whatever it took and putting the fate of everyone else above her wants and needs. She really went through it in Captive between the lies, secrets, and betrayals she couldn't trust a soul just when she thought she found herself trusting someone they would turn around and betray her or worse and I loved her even more after the fact because she just dusted off her bruised feelings and kept focusing on what was important. The romance...that is where I have had an issue with in this series so far even in Pawn and now in Captive I don't feel the chemistry between her and Benjy at all. To me I just get this friend vibe between the two even with all their kissing and sweet words I just don't believe it. Then there is Knox well my goodness that boy was infuriating in the worst way there is nothing between Kitty and Knox in this book whatsoever except for rude exchanges of words but there was a hint of something and honestly I would love that to grow to be more in the next book just because even though I don't know what to make of Knox anymore one thing is for sure he is a hell of a lot more interesting of a character then Benjy ever has been. There were quite a few things that happened that has me very excited for the next book. With the way things ended I can't wait to see what Carter has in store for us in Queen which is the next book in the series. Overall captive was amazing and even better then Pawn. If you haven't picked this series up yet I highly recommend you do so. ~ "...How many people are going to die before it's all over because you care more about your own worthless life than the freedom of millions?" ~ "Having to be someone else all the time-never getting to be me anymore, having my every move watched....I'm losing myself, Beny."